Best wide-angle lenses for Canon in 2019: which one should you buy? 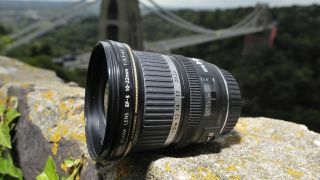 The standard zoom lens that you probably bought with your Canon DSLR gives a reasonably wide viewing angle at its shortest focal length, but a wide-angle zoom can really broaden your horizons. Ultra-wide viewing angles enable you to shoehorn majestic skies and sweeping landscapes into the image frame, while there’s a potentially bigger bonus for indoor photography, if your back is literally up against the wall when you’re trying to squeeze a scene into the picture. But wide-angle lenses aren't just for cramming more into the frame. They also enable you to exaggerate perspective for creative effect – you can really pull out objects of interest in the foreground, against a rapidly receding backdrop. Yet another bonus is that very short focal lengths equate to a huge depth of field, so you can keep close foreground and distant background areas simultaneously sharp. When you’re buying a wide-angle lens, it’s vital to choose one that’s the right fit for your EOS DSLR. Unlike with standard and telephoto lenses, you really need to go for an APS-C format lens if you’re shooting with that type of DSLR, otherwise the wide-angle advantage will be mostly lost. Let’s pick out the best buys for both APS-C format and full-frame Canon DSLRs on the market today. A major revamp of Tamron’s original 10-24mm wide-angle zoom, this edition has a new optical design with enhanced aspherical and LD (Low Dispersion) elements. It also gains a new HLD (High/Low toque-modulated Drive) autofocus system and VC (Vibration Compensation) stabilization, which were absent in the original lens. Autofocus is faster, quieter and more accurate, and offers improved handling – this is because the focus ring no longer rotates during autofocus, while there's also now full-time manual override. Build quality is very good, with a full set of weather seals and a keep-clean fluorine coating on the front element. The lens is compatible with Tamron’s optional ‘TAP-in Console’, for applying firmware updates and fine-tuning via a USB-connected computer. Sharpness is excellent across the entire image frame, throughout the whole zoom range, which is always a challenge for ultra-wide zooms, and there’s very little barrel distortion at the shortest focal length. All in all, it’s a star performer. The 1.6x crop factor of Canon’s APS-C format DSLRs makes ultra-wide viewing angles rather a challenge. Compared with most competing zoom lenses, this Sigma shaves 2mm off the shortest focal length, and gives a truly eye-popping boost to the maximum viewing angle. It’s not a weather-sealed lens, but build quality is very good. The ring-type ultrasonic system delivers fast and quiet autofocus, complete with the usual full-time mechanical override. Four top-quality FLD (Fluorite-grade Low Dispersion) elements are featured in the optical path to enhance image quality, while Super Multi-Layer Coatings are on hand to guard against ghosting and flare, along with a built-in hood. This also protects the bulbous front element – there’s no attachment thread for filters. although at least the two-part lens cap enables you to use 72mm filters at the long end of the zoom range, without any vignetting. Despite the extreme viewing angle at the short end of the zoom range, sharpness remains impressive into the corners of the image frame. Colour fringing and distortions are also well controlled, making this lens the ideal choice if you want to take your viewing angles to the max. The highly acclaimed Tokina 11-16mm was one of the first ultra-wide-angle zoom lenses to hit the market for APS-C format DSLRs, and the newer 11-20mm retains the same maximum viewing angle, but extends the long end of the zoom range. Some say this is irrelevant, as you normally shoot with this kind of lens at or near its minimum zoom setting – but that’s missing a trick, because at the long end you’ll typically get much less distortion than with a ‘standard zoom’ at the same focal length. Like the older Tokina, this lens has a relatively fast aperture rating of f/2.8 that remains available throughout the zoom range. Another similarity is Tokina’s trademark ‘one-touch focus clutch’ mechanism. This enables you to switch between autofocus and manual focus simply by clicking the focus ring forwards or backwards; some love it, some hate it. The autofocus motor itself is quite noisy. Image quality is very good, with pleasing sharpness even at f/2.8, and fairly well-controlled distortions. The main selling point is the f/2.8 aperture, which enables relatively fast shutter speeds even indoors or at twilight, without you having to push your camera’s ISO setting too far – it’s therefore a good lens for freezing action under poor lighting. Like the Tokina 11-20mm lens, this Sigma has a constant-aperture design, although it’s two-thirds of a stop slower at f/3.5. Even so, it has the same advantage for manual exposure mode shooting, in that the aperture remains fixed throughout the zoom range. Optical attractions include two ELD (Extraordinary Low Dispersion) elements and an SLD (Special Low Dispersion) element – considering the budget price, the inclusion of posh glass along with a fast and whisper-quiet ring-type ultrasonic autofocus system is a very pleasant surprise. An upside over Sigma’s 8-16mm is that this lens has a detachable hood and a filter attachment thread. Sharpness is excellent throughout the zoom range in the central region of the frame, but drops off a little more than usual in the corners. Barrel distortion at the minimum focal length is fairly minimal, as is colour fringing throughout the zoom range. This lens has been on the market for almost a decade now, and predates Sigma’s ‘Global Vision’ lineup, but it’s unbeatable value at the price. We prefer this new Canon lens to the veteran EF-S 10-22mm, and not just because it’s only about a third of the price. The 10-18mm is wonderfully compact and lightweight for a wide-angle zoom – it’s actually less than half the weight of the competing Sigma APS-C format lenses, so ideally suited to travel photography. The weight saving is partly due to the mounting plate being made from plastic rather than metal, but the lens still feels reasonably robust. The STM (Stepping Motor) autofocus system is fast for stills and ideal for video capture, delivering smooth focus transitions and being virtually silent in operation. Another advantage over the Canon 10-22mm is that this lens adds image stabilization, which is great for indoor or twilight shooting – and yes, camera shake can still be a problem even with ultra-wide lenses. In our tests, this lightweight lens beat the bigger Canon 10-22mm for sharpness and control over colour fringing. It’s great value at the price, although, typically for a Canon non-L-series lens, you have to buy the hood separately. Sigma has really gone to town with wide-angle zooms in its Global Vision lineup, but this lens is the latest and greatest. It has a slightly more modest maximum viewing angle than the 12-24mm Art lens, but a faster aperture rating; both are practically identical in size and weight. High-tech glass includes an ultra-high-precision moulded glass aspherical front element, combined with three FLD (Fluorite-grade Low Dispersion) and three SLD (Special Low Dispersion) elements. The lens is immaculately engineered and, unlike the Sigma 12-24mm Art, it gains a full set of weather seals instead of just a sealed mount. A fluorine coating is applied to repel muck and moisture, while the built-in lens hood gives physical protection to the protruding front element, as well as helping to reduce ghosting and flare. Unusually, however, you can have this exchanged for a shorter, circular hood for minimizing shadows when using multiple cameras in video capture for creating virtual reality environments. Sharpness and contrast are very impressive even when shooting wide-open at f/2.8, and while distortions are minimal from the Sigma 12-24mm Art, this lens is virtually distortion-free. Colour fringing is also negligible, even around high-contrast edges towards the extreme corners of the frame. It’s an absolutely stellar lens in every respect. If money’s no object, the Canon EF 16-35mm f/2.8L III USM is an f/stop faster than this lens, and a darling of the most demanding pro photographers; however, it’s bigger, heavier, lacks image stabilization and costs twice the price. Meanwhile, the Canon EF 11-24mm f/4L USM has a much wider maximum viewing angle but is fiendishly expensive, making the Sigma 12-24mm Art a much better-value buy. For an own-brand Canon wide-angle zoom for full-frame cameras, this lens is our favourite. It’s relatively compact and lightweight, has a highly effective 4-stop image stabilizer, and maintains a very high standard of build quality and performance throughout. Like most L-series lenses, it’s robust and weather-sealed, with excellent handling. Optical highlights include two UD (Ultra-low Dispersion) elements and Super Spectra coating. Fluorine coatings are also applied to the front and rear elements. Centre-sharpness is as spectacular as from the Sigma 14-24mm, although it drops off a little more towards the extreme edges and corners of the frame. Colour fringing is controlled particularly well, and there’s fairly little barrel and pincushion distortion at the short and long ends of the zoom range respectively. It’s certainly no lightweight in terms of performance and, unlike many wide-angle zooms for full-frame DSLRs, it has a detachable lens hood and filter attachment thread. The upgraded ‘Art’ edition of Sigma’s 12-24mm lens goes head-to-head with the Canon EF 11-24mm f/4L USM, but only costs about half the price. Unlike the previous edition it has a constant-aperture design, generally preferred by enthusiast and professional photographers. The revamped optical path incorporates an extra-large-diameter aspherical element and five premium FLD (Fluorite-grade Low Dispersion) elements. Fluorine coatings are applied to the front and rear elements, and the mounting plate is weather-sealed. The uprated ring-type ultrasonic autofocus system is faster, and the new lens is compatible with Sigma’s optional USB Dock for applying firmware updates and fine-tuning. One downside is that the Art lens is rather bigger and heavier than the older edition. Sharpness and contrast are excellent, and sharpness doesn’t drop off too much even at the extreme corners of the frame, despite the ultra-wide maximum viewing angle. Overall, it’s the best-buy zoom on the market for full-frame DSLRs, if you want maximum viewing width. This Tamron gives a maximum viewing angle that’s midway between that of the Canon 16-35mm and Sigma 14-24mm. It shares the fast and constant f/2.8 aperture of the Sigma, while adding the bonus of a highly effective 4.5-stop optical stabilizer. The higher-performance stabilizer is one of the key upgrades in the new G2 (Generation 2) edition, along with a faster and more accurate autofocus system. Like the original lens, there’s a full set of weather seals, but the fluorine coating on the front element is improved, and the Canon-fit version of the G2 also adds a rear filter holder in its mounting plate. One drawback is that the Tamron is nearly twice the weight of the Canon 16-35mm, but that’s the price you pay for the faster f/2.8 aperture rating. High-quality optics include a specially developed XGM (eXpanded Glass Molded Aspherical) element and several LD (Low Dispersion) elements, and the G2 features a newly developed coating, which is used in addition to the previous lens’s mix of nano-structure and conventional coatings. Image quality and handling are highly impressive and, even though the G2 is a third more expensive than the original edition, it’s still good value at the price. What price a pro-spec, fast f/2.8 wide-angle lens? Billed as a ‘pro’ lens, this Tokina has a high standard of build quality with a weather-sealed mounting plate, and it’s typically big and heavy for a wide-angle zoom with an f/2.8 constant aperture rating. You don’t get much change out of a kilogram, but at least the price tag is relatively lightweight – indeed, the Tokina is only around a third to half the price of most other full-frame compatible wide-angle zooms. Whereas the Tokina 11-20mm lens for APS-C format cameras has a noisy autofocus motor, this one employs a 'silent' DC motor and GMR (Giant Magnetoresistance) module. It's certainly much quieter, but autofocus speed is still nowhere near as fast as with most competing lenses that use ring-type ultrasonic systems. Tokina’s typical 'one-touch focus clutch' is retained, so the focus ring has a push-pull action for switching between manual focusing and autofocus. Image quality is very good overall, with high levels of centre sharpness and well restrained colour fringing, although image corners could be a little sharper. As with many competing lenses, the built-in lens hood helps to avoid ghosting and flare, but precludes the straightforward attachment of filters.